The backyard patio, the hub of a home's outdoor activities, should officially be cataloged as an American icon. Virtually no home exists without one. And outdoor fun, such as grilling or relaxing revolve around backyard patios. Although the sizes range, from courtyards to side yards to sprawling outdoor living areas, the American home just isn't the same without a backyard patio. Now you can learn about all the details that make up a functional and appealing patio. 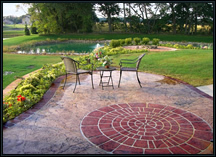 Using concrete is the start that will provide your patio with a firm foundation and an appealing, multi-use surface. 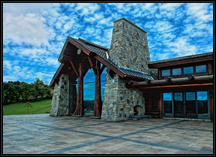 Use this site to learn about concrete patio cost, to get patio design ideas, to learn about surface options such as stamped concrete patios, and to view pictures of other home backyards. Because there are so many options and outdoor patio designs, this site will help get you started in asking the right questions and learning about what the possibilities are. Once you get your backyard patio ideas together for shape, surface texture, color and design, then use our directory to find a contractor in your local area who specializes in concrete patios. For more on concrete patios visit ConcreteNetwork.com.